This rare book collects the first three London Evening News Moomin comic strips written by Tove Jansson during the 1950s: Brigands, Family Life and Moomin on the Riviera. 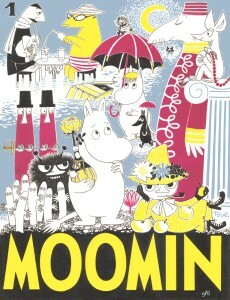 Although the title Moomin 1 suggests a series, no further volumes were produced by the publisher. 49 years later, however, a new collection is in the works! Publishers Drawn and Quarterly are releasing a new collection of the Moomin comic strips, starting with Volume 1 in 2006, to be followed by four more volumes over the next four years. The first book will contain the stories Brigands, Family Life, Moomin on the Riviera and Moomin's Desert Island.